It’s World Thinking Day, and we’re so excited to take a peek into how Girl Scouts and Girl Guides around the world are celebrating! Because although we take great pride in this unique, worldwide movement every single day, today is extra special as we rally our global sisterhood and celebrate it on a whole other level. That’s right. 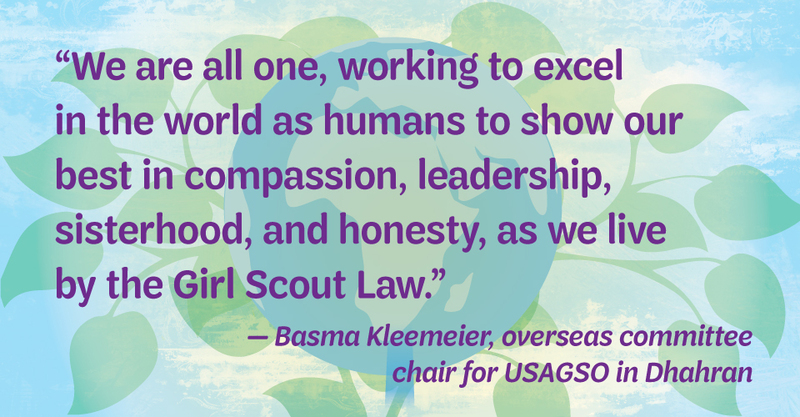 Today is a day of global connection, action, and pride in all of the amazing things that Girl Scouts and Girl Guides do across the map. This year, it’s also a day to “Grow” as we encourage girls to explore, stretch, and take on new challenges while celebrating what it means to be part of this one-of-a-kind family. So today, as Girl Scouts and Girl Guides from 146 countries are inspired to come together, share, and learn from one another, let’s hear how girls in parts of Saudi Arabia and Japan are celebrating World Thinking Day! On Saturday, Girl Scouts in Dhahran, Saudi Arabia, not only celebrated World Thinking Day but also commemorated the 70th anniversary of Girl Scouting in Dhahran—what an epic coincidence! And because women in Saudi Arabia don’t get many opportunities to join the workforce, during the special gathering of about 130 girls and adults (including girls from the Ras Tanura Compound, where Saudi employees live), the audience heard from female VIP speaker Huda Al Ghoson. Currently the executive director for human resources at Aramco, a Saudi Arabian national petroleum and natural gas company based in Dhahran, Huda spoke about how girls and women can successfully challenge the status quo. That’s so Girl Scouts! As part of the dual celebration, and in honor of this year’s World Thinking Day theme, Girl Scouts in Dhahran also painted a tree in the Girl Scout house (the dedicated Girl Scout space provided by Aramco), using each leaf to show how they plan to change the world (or their community). And they even got to enjoy an exhibition of Girl Scout heritage and historical artifacts with different storytelling stations and interactive activities to celebrate the 70th anniversary of Girl Scouting in Dhahran. Basma Kleemeier, overseas committee chair for USA Girl Scouts Overseas in Dhahran said, “We really liked the ‘Grow’ theme this year, as the Girl Scout program here in Dhahran really grew from a small start with a primarily American membership to 250 girls and 60 leaders with nationalities from all over the world.” The Girl Scouts in Ras Tanura now come from a variety of countries, including Bangladesh, Bolivia, Canada, Croatia, France, Holland, Indonesia, Jordan, Lebanon, Nigeria, Poland, Saudi Arabia, South Africa, Syria, the United Kingdom, and the United States. Talk about global! “We are all one, working to excel in the world as humans to show our best in compassion, leadership, sisterhood, and honesty, as we live by the Girl Scout Law,” Basma said. We just love that! When girls in Dhahran are not busy celebrating holidays and anniversaries, they participate in adventurous campouts, including activities like archery and rappelling. They also hold annual fundraising events, visit museums to learn about Saudi culture, and interact with the community to complete award projects, many of which focus on improving the local community and the Dhahran region as a whole. This is what leaders are made of! 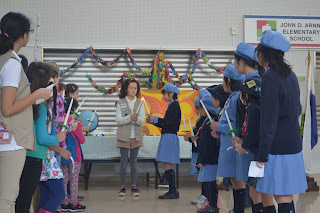 Simultaneous with the celebration in Saudi Arabia, Girl Scouts at Camp Zama (a U.S. Army post) in Zama, Japan, celebrated World Thinking Day by growing their cultural knowledge. 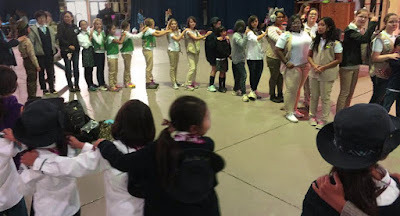 Each troop (more than 100 girls total, including local girls) hosted a table to provide attendees with information about different countries’ traditional games, dances, food, and other customs. When the girls at Camp Zama are not celebrating World Thinking Day, they’re getting fish pedicures, riding bikes around the Imperial Palace in Tokyo, discovering Chinatown, and camping under the stars as they gaze at Mt. Fuji. They also sing carols at the local nursing home, help feed the homeless, clean up beaches and rivers, and gather materials for local orphanages. And their Japanese sister scouts often invite them to special events and ski trips or teach them how to make Japanese dishes. So many enriching experiences! Meanwhile at the Misawa Air Base in Misawa, Japan, girls and leaders are gearing up for their World Thinking Day celebration taking place this Sunday, February 26. More than 200 Japanese and U.S. Girl Scouts, leaders, and friends will attend the event, during which each troop (14 troops total!) will present a four-minute activity—either a dance, game, song, or some other activity that can be easily understood no matter the language. The best part? The whole activity will be played out as if the girls were on an airplane. So cool! Here’s how that works: the girls will sit in their assigned sections to prepare for takeoff, with the older girls taking the lead as pilots, flight attendants, and emcees. The activity will then play out as in-flight entertainment (with snacks, layovers, and all!) in which the different troops will present their activity and engage their friends. Kelli encourages girls in the United States, not just abroad, to get out of their comfort zones and try something different. Girls can contact a committee, service unit, or council in another part of the world to be picture pals, sharing their lives with girls who walk similar paths—girls who are trying to make the world a better place, just like the group in Japan. “Find out what girls are doing in their communities, share your take-action projects with them. Learn from each other,” Kelli suggested. 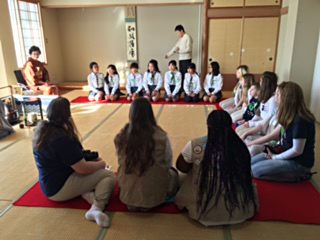 For example, Girl Scouts and Girl Guides in Misawa are active both on and off base. They volunteer for their base animal shelter, care for the environment, make care packages for servicemembers and their families when they’re hospitalized, and make baby blankets for newborns. The girls even put together a special baby basket every year for the first baby girl born during Girl Scout week. They also fundraise for a local school for kids with disabilities, clean up beaches, and do so much more. What an incredible group of leaders and go-getters! You can learn more about our overseas communities at usagso.org. So? 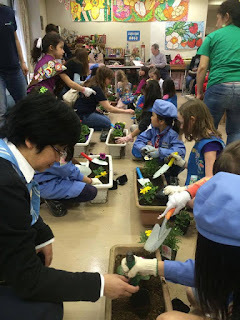 How AWESOME is it to be able to get a glimpse of what Girl Scouts and Girl Guides do in other countries, and what better day to recognize them than today?! Have your own fun plans to celebrate World Thinking Day? Don’t forget to inspire your fellow Girl Scouts today by sharing activities and photos on social media with the hashtag #WTD2017. Because although we may be miles and miles away in distance, we’re all right beside one another in heart and mission. 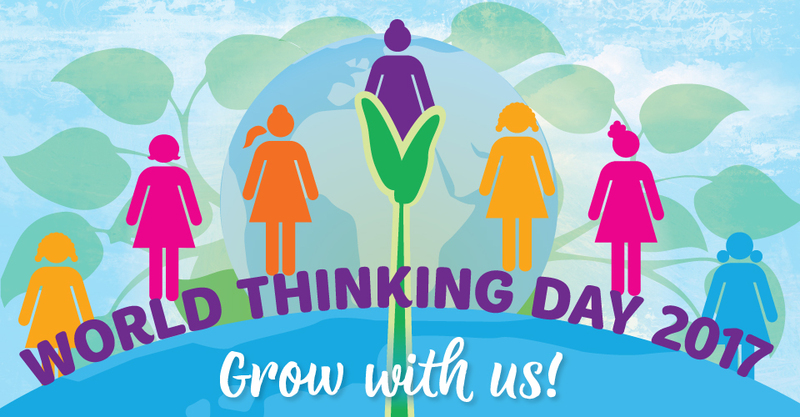 We hope you have a terrific and inspiring World Thinking Day! Help more girls experience this great big world by donating to the Juliette Low World Friendship Fund today.